Ships from Hong Kong. This play set includes mugs, spoons, milk bottles, pacifiers and bowls. 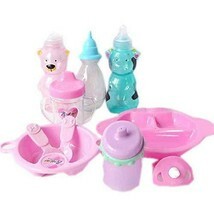 It is a feeding combo for baby doll. Great gift for your little girl. Recommend age 3 and up.